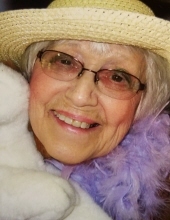 Elsie Gardner, age 87, passed away on January 15, 2019 at Milestone Senior Living in Eagle River, Wisconsin. She was born on May 14, 1931 to her parents Edward and Matilda Ermis. Elsie was formerly of Newburg, Wisconsin and a resident of Eagle River for the past 3 years. She was an avid seamstress and upholsterer, and loved gardening. Elsie treasured being a grandma to all her step grand and great grand children. Elsie was preceded in death by husband Dorsey Tisdale and second husband David Gardner, her parents, and brother Emery. She is survived by her step sons: Leif (Patti) Gardner, Mark (Rose) Gardner, Kevin (Lori) Gardner, Cameron (Julie) Gardner; brothers Lester and Richard Ermis; sister Sandra (Kevin) Finney; and 10 nieces and nephews. To plant a tree in memory of Elsie Gardner, please visit our Tribute Store. "Email Address" would like to share the life celebration of Elsie Gardner. Click on the "link" to go to share a favorite memory or leave a condolence message for the family.